How to Cite This Chapter: Singh Ospina N, Brito JP, Kokot F, Franek E, Płaczkiewicz-Jankowska E. Parathyroid Glands. McMaster Textbook of Internal Medicine. Kraków: Medycyna Praktyczna. 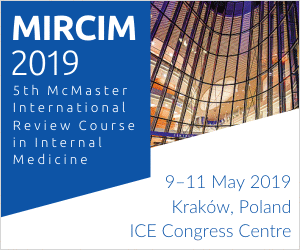 https://empendium.com/mcmtextbook/chapter/B31.II.24.2 Accessed April 23, 2019. In ~90% of the general population, 4 parathyroid glands (parathyroids) are present; the number of glands in the remaining 10% of the population may be higher—up to 8 glands—or lower. The glands are usually located behind the thyroid gland, near to its upper and lower poles; in ~10% of people, one or more parathyroid glands are located ectopically, for instance, within the thyroid gland, or in the thymus, pericardium, or mediastinum. Anatomy of the parathyroid gland: Figure 1. 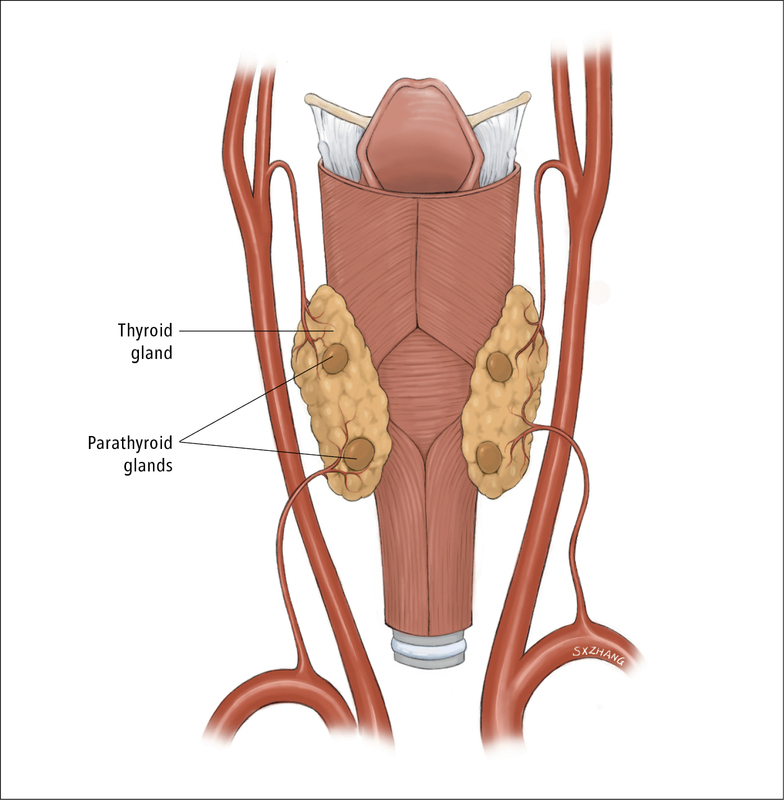 Parathyroid glands secrete parathyroid hormone (PTH), which is an amino acid polypeptide that undergoes cleavage necessary for transport, release, and final biological activity. The predominant form of the hormone present in the serum is dependent on the serum calcium level. PTH 1-84 is the biologically active form of the hormone. Currently, the universally adopted method for measurement of PTH is the determination of the so-called intact PTH (iPTH), which includes both PTH 1-84 and large terminal PTH fragments (normal range, 1.1-6.7 pmol/L or 10-60 pg/mL). The most recent assays measure the so-called bio-intact PTH (bio-iPTH), which is believed to measure only PTH 1-84 (normal range, 6-37 pg/mL). The key factor regulating the secretion of PTH is the serum ionized calcium level (Figure 2). The secretion of PTH is stimulated by hypocalcemia and inhibited by hypercalcemia. PTH increases the synthesis of 1,25-dihydroxycholecalciferol (1,25(OH)2D3, the active form of vitamin D3) in the kidney, increases the reabsorption of calcium in the distal renal tubules, and inhibits the renal reabsorption of phosphate. It also increases the intestinal absorption of calcium and phosphate mediated by 1,25(OH)2D3. At physiological levels, PTH has substantial effects on bone formation and remodeling, as it increases serum calcium levels and urinary excretion of phosphate, thus reducing serum phosphate levels. Excess PTH has osteolytic effects. Regulation of the plasma phosphate concentration is determined mainly by the renal threshold for phosphate reabsorption in the proximal tubule, in addition to bone release and gut absorption. Hyperphosphatemia can lead to a reduction in calcium levels, inhibition of 1,25(OH)2D3 synthesis, and stimulation of PTH secretion irrespectively of hypocalcemia and 1,25(OH)2D3 deficiency. A decreased level of inorganic phosphate stimulates the synthesis of 1,25(OH)2D3 even in the absence of PTH. 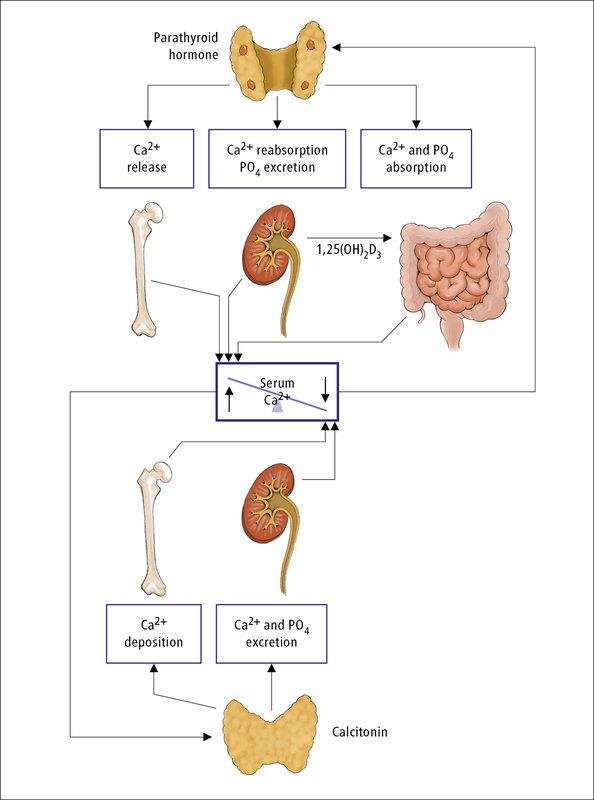 New, currently researched metabolic links in the regulation of calcium and phosphate metabolism are phosphatonins, which appear to have mostly a phosphaturic effect (eg, fibroblast growth factor 23), and the Klotho protein; they act by suppressing the expression of the sodium-dependent phosphate cotransporters in the renal proximal tubules. In addition, a vitamin D counterregulatory effect has also been described, acting through the inhibition of the synthesis of 1,25(OH)2D3, and the stimulation of 24-hydroxylation of both 25-OH-D and 1,25(OH)2D3, rendering the hormones inactive. Figure 1. Anatomy of the parathyroid gland (posterior view). Illustration courtesy of Dr Shannon Zhang, Department of General Surgery, Queen’s University, Kingston, Canada. Figure 2. Physiological control of calcium metabolism by parathyroid hormone and its thyroid-produced counter, calcitonin. Illustration courtesy of Dr Shannon Zhang, Department of General Surgery, Queen’s University, Kingston, Canada.